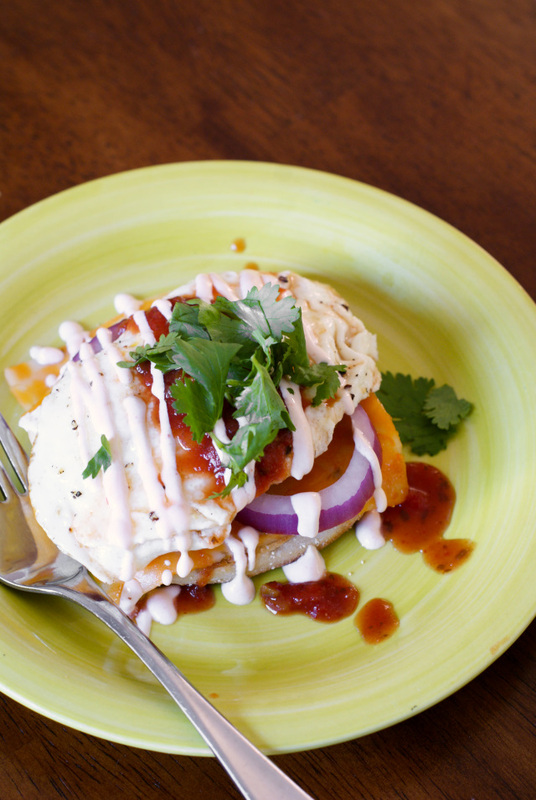 Open-Faced Mexican Fried Egg Sandwiches with Sriracha Cream Sauce are a great way to bring a bold and flavorful zip to you morning breakfast routine! It's just about 100% certain that I will choose a savory breakfast as opposed to a sweet one if given the choice. I've always been drawn to the salty savory side, no matter what time of day it is. I also just happen to love Mexican food. Cilantro is my very favorite fresh herb and I love everything about bold, fresh, Mexican flavors. What's not to love?! 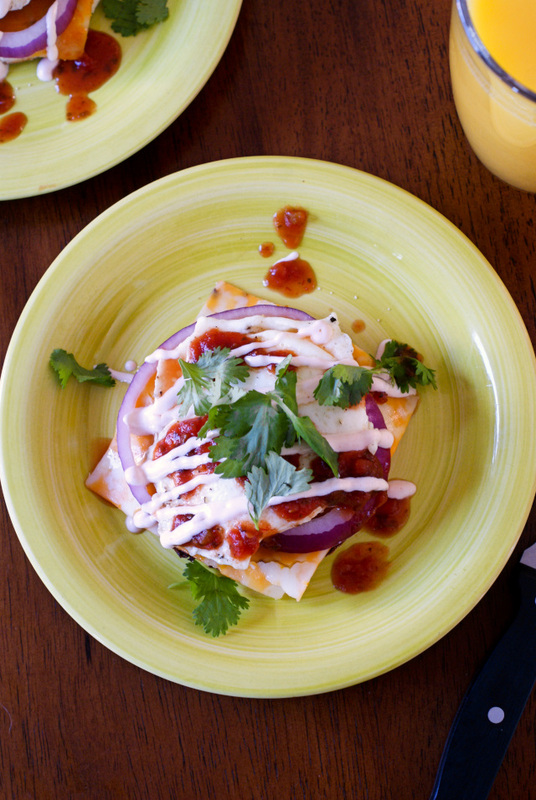 This recipe combines my love of a savory breakfast and my love for Mexican food. It's a glorious pairing, my friends. Thank goodness I am okay with onion breath before 8 am. So worth it. I like to make this open-faced sandwich on an english muffin for the base. The muffin holds up really well to all of the saucy goodness piled on top of it, which is important when you have a hearty sandwich like this. And you have to make sure you cook your eggs so the yolk is nice and drippy. Oh, how I love a velvety runny yolk. Just fantastic. Once everything is put together, the outcome is a cheesy, spicy, creamy, fork and knife sandwich that really wakes up your taste buds! 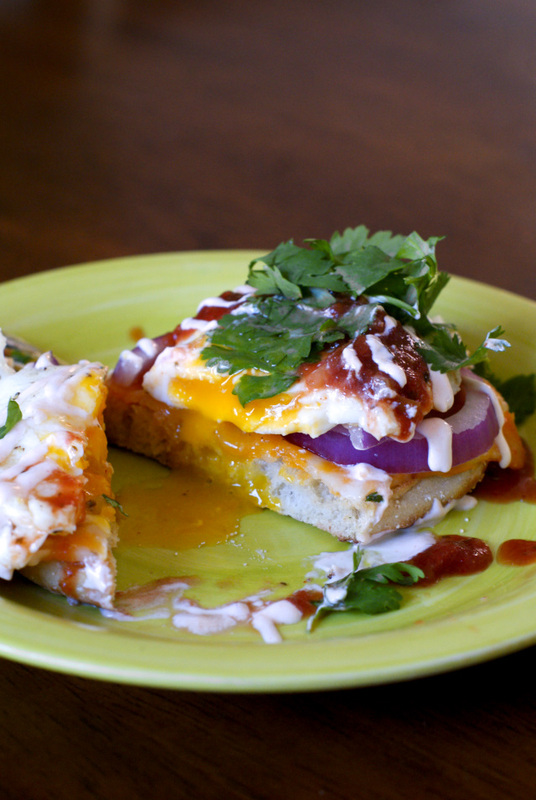 If you love a Mexican-inspired breakfast, this sandwich is for you! Heat the butter over medium heat in a small skillet until melted. When the pan in nice and hot, crack the eggs into the pan. Fry the eggs for 2 minutes, carefully flip them, then cook for an additional minute. 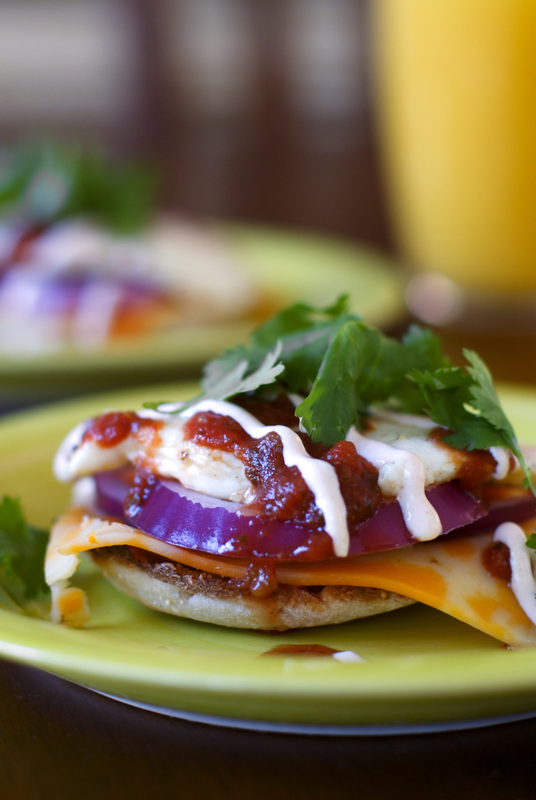 Assemble each sandwich with the english muffin on the bottom, then one slice of cheese, the red onion rings, followed by the fried egg. Top with one tablespoon of salsa. In a small bowl, stir together the sour cream and sriracha. Drizzle over the sandwiches and garnish with fresh cilantro. Serve with a fork and knife! The sliced Colby-Pepper Jack cheese I used was made by Sargento. To get the pretty drizzle on the cream sauce, I spooned it into a baggie, snipped off a tiny tip of one corner, then drizzled over the sandwiches.